Greetings from the Foodion Editorial Department. We are currently organizing the Foodion Monthly Pickup that highlights a dish using seasonal ingredients every month but for this month, we have an all-new event—Foodion Photo Award. 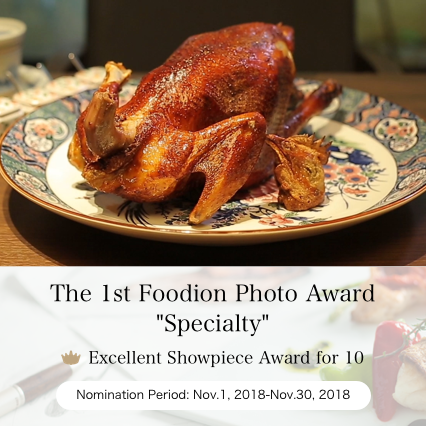 The 1st Foodion Photo Award features “Specialty”. 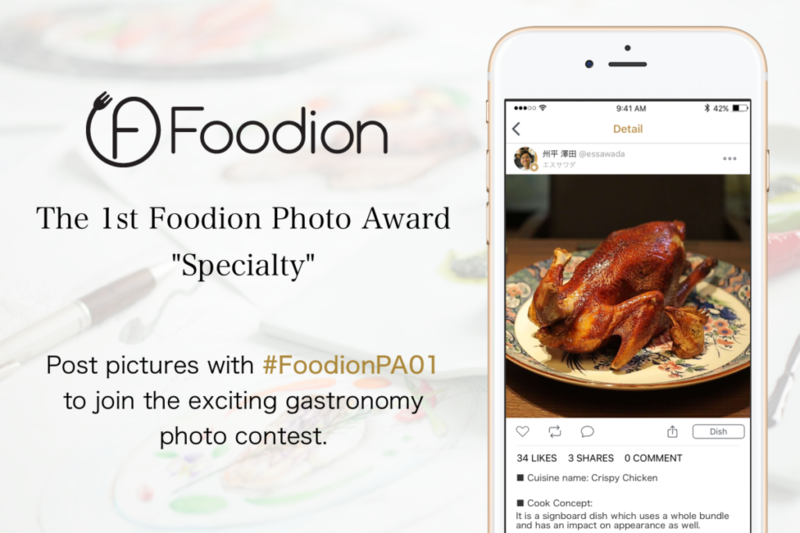 Post a photo that shows off your specialty dish together with its main description and the hashtag “#FoodionPA01” (or in small letters: #foodionpa01) on the Foodion app. Participation to the Foodion Photo Award is just as simple as that. *Please be aware that you may not be considered for the award if there is a typo in the hashtag. *For multiple hashtags, please add a space in between. Hashtags do not work when the words are not separate. 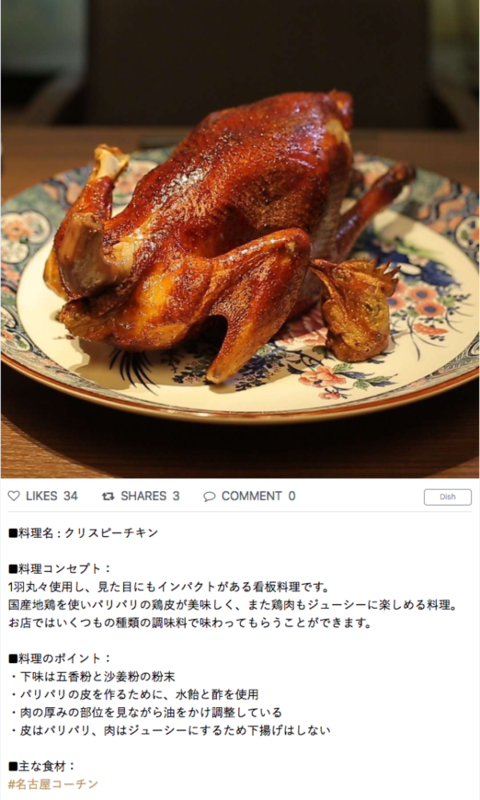 Besides the photo of the dish, we will take into consideration the information on the dish (main description, background of the idea, etc.) in selecting prizewinners, so make sure to showcase the highlights of your specialty dishes in the accompanying text! Submission period is from November 1st to November 30th 2018. Don’t pass on the chance to join the 1st Foodion Photo Award! Post a photo that shows off your specialty dish together with its main description and the hashtag “#FoodionPA01”. *Please set privacy settings for the post as Public. *All photos with the hashtag #FoodionPA01 shall be regarded as having approved our application terms and conditions. Selected contestants of the Foodion Photo Award will be awarded an original Foodion novelty gift. We will send notifications to you by email to the email address registered under your Foodion account so please make sure that you are reachable via your registered email address. Please post photos of dishes that were proudly prepared by you. If posting photos of dishes prepared by a third person, please get the person’s permission before posting it for the Foodion Photo Award. Contest applicants shall declare and warrant that the photos are posted by them, that they have the legitimate rights to license their use to our Company, and that the posted data do not infringe on any copyrights, portrait rights, privacy rights, and publicity rights of third parties. All or part of the messages, photos, and videos uploaded by applicants may be edited and used by our Company on our homepage and official social media sites, etc. as well as other advertising media. Please note that we will not reply to any inquiries about the final results. For information about agreement on the rights to messages, photos, and videos posted on Foodion, please check out Foodion’s Terms and Conditions of Use. Please make sure you read and agree with these Terms and Conditions before participating in the Foodion Photo Award (hereinafter referred to as this Contest) organized by Cookbiz Co., Ltd. (hereinafter referred to as our Company). Posts uploaded to the contest shall be regarded as having agreed to these terms and conditions. November 1st to November 30th, 2018. We will notify winning contestants between mid to late January 2019 with the prize delivery form. Please make sure that you are reachable via your registered email address on Foodion. *Notification to winning contestants may be delayed in the case of unforeseen circumstances. Thank you for noting. Winning contestants will be notified via email at the email address registered on Foodion. Please click on the URL to access the prize delivery registration form and fill in the required information before the deadline. *The delivery of prizes may be delayed in the case of unforeseen circumstances. Thank you for noting. *If the prizes fail to be delivered due to a faulty address or email address or in the absence of a new registered address or prolonged absence, your selection as a winning contestant will be deemed invalid. *If you do not submit the form within the registration period, it shall be deemed that you have abandoned your selection as a winning contestant. *Winning contestants do not have the right to transfer their winning rights to a third party. The operations of this Contest will be carried out by the contest office (hereinafter referred to as our office). In order to ensure smooth operations, our office may change the application conditions of the Contest and take other actions if deemed necessary based on the judgment of the office. Thank you for noting. For more information, please see the section on other important notes. Please only participate in the Contest after reading and approving of the following matters. In joining the Contest, the applicant shall follow the operation methods of our office and shall not file any objections regarding our operations. Our office may contact you with any notifications of this Contest or for prize deliveries. Our office will not bear any responsibility in the event of any damages caused by the usage or usage termination of this Contest site or if the site becomes unusable. Prizes may be subject to change. Thank you for noting. Our Company will not bear any responsibility in the event of any trouble or damages (direct or indirect damage) through the usage of this site. Thank you for noting. For inquiries regarding the Contest, please contact us via the email address below. Established on November 1st, 2018.